"I found "Born Losers" a confirmation of an old belief that in American history there is a crash in every generation sufficient to mark us with a kind of congenital fear of failure. This is a bright light on a buried strain in the evolution of the United States." "By examining the lives and careers of a number of businessmen who failed during the 19th century, [Scott Sandage] portrays what we reflexively think of as the dark side of the American dream but what is, in reality, an only slightly exaggerated mirror of the reality with which ordinary people -- i.e., thee and me -- are fated to contend." "In his intriguing new book Born Losers: A History of Failure in America (Harvard), Scott Sandage argues that the mid-19th century saw a redefinition of failure--from something that described a lousy business to something that defined a whole life." 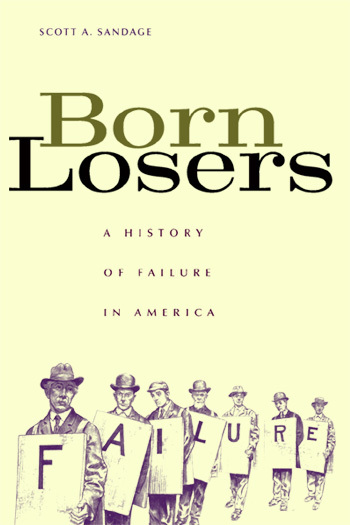 "Born Losers," admirably concise and formidably researched, is the history of America's reverse Horatio Algers. Scott A. Sandage, an associate professor of history at Carnegie Mellon University, logged a decade in the library to produce what amounts to an authoritative chronicle of the risks of lending and borrowing in 19th-century America".